It’s snowing here in Northern New Jersey, but that’s old news. Okay. You’re going to have to listen to me rant! Or else you can leave quietly. Immediately. The snow, the unexpected snow, started around here at 7:30 a.m. today. It flew thick and fast for hours. Mind you, the weatherman kept telling me that this is not the snow he’s been talking about; this was unexpected snowfall. So, okay, the unexpected snowfall lasted for hours. 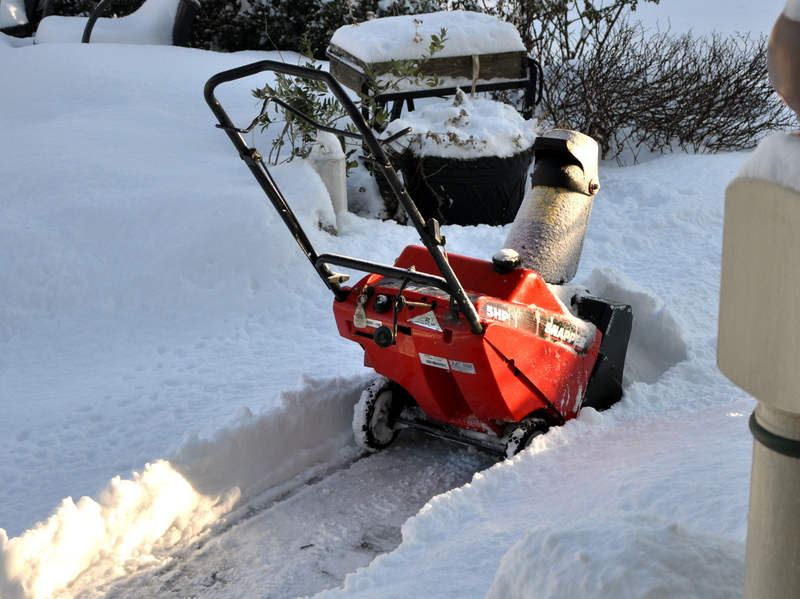 Our snow blower works just fine as long as the snow isn't more than 6" deep! At about noon, I fired up our little snow blower and tossed all the snow on our driveway and sidewalks onto the ever-growing piles on our lawn. I shoveled out the bottom of the driveway too. That’s the part that gets ugly sometimes, particularly when I get splashed with the crappy snow/slush mix that the cars speeding by catch me with. Ah yes, I’ve mentioned that in a previous blog post. I retired to the house, made a cup of hot tea and called my girlfriend Pat; she lives in Colonia, NJ, south on the Garden State Parkway about 30 minutes; she had been outside shoveling just like me. But unlike me, she had hand surgery in December and recently had the awesome pins removed from her hand; she’s in physical therapy three times a week to get her mobility back in said hand. So, yes, my Amazonian girlfriend was shoveling snow one-handed today. When I asked, she mentioned in her typical low-key way that it was no big deal since she used a snow pusher, and when she got the piled-up-with-snow pusher to the edge of her driveway she just used her foot to launch the pusher/shovel loaded with snow into the air so the snow would just fly off the pusher/shovel. Easy peasy. God, I love Pat. And have I told you that I always, always want her on my side in a fight? Trust me when I tell you that you do too. The woman is as tough as nails and then some. After talking with Pat and realizing that I was a whiny so and so, I looked out the window. More snow, a lot more snow had accumulated. Stiffening my resolve (which was now about as stiff as my shoulders and thigh muscles) I went back outside to hand shovel the driveway and sidewalks of an inch or so more of fresh snow. Then I drove to our local high school and picked up my daughter Tory. All her activities for the evening were cancelled so she’s sleeping on the couch while I talk to you. Fun stuff, huh? 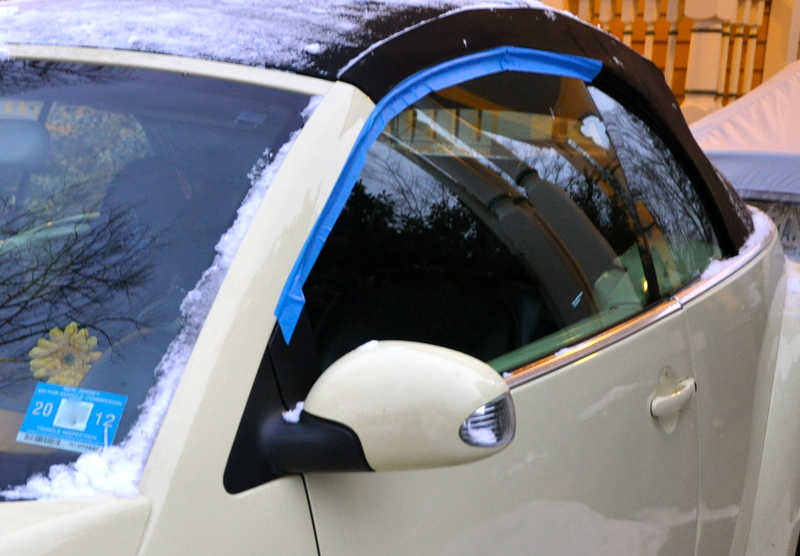 No more blue tape on Sunny's window. Nope. And it only cost a small fortune to fix that window. Yup. I’m off to bed now because tomorrow. . .wait for it. . .I will be shoveling snow! The anticipated snow!